When the United States formally took possession of the Louisiana Territory on December 20, 1803, effectively doubling the size of the country, Napoleon was busy in Europe trying to outwit the English and other Continental powers. Previously, "the little corporal" had envisioned a worldwide empire with French flags encircling the globe, but he had recently been awakened to the harsh realities of the New World. The year before, Napoleon's brother-in-law and 40,000 French soldiers perished in the malarial jungles of Haiti while trying to put down a slave rebellion. With Haiti and Santo Domingo lost as a base of operations in the Americas, Louisiana's luster faded for the ambitious French dictator, and its vast lands came to represent an asset to be cashed in and used to wage successful wars on the continent of Europe. To Americans, Louisiana was a plum catch, and unlike later land purchases such as Alaska, there was no doubt at the time about the value of the land. Some of the richest farmland in the world was within its borders, farmland that would eventually be called "the breadbasket of the world." One hundred years later, the Louisiana Purchase was still viewed as an event of monumental importance in the nation's history. To commemorate the centennial of its annexation, Congress appropriated five million dollars for the construction of a world's fair and its associated buildings and exhibits. 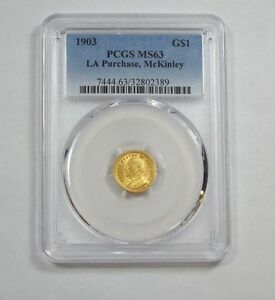 As plans were made for the Louisiana Purchase Exposition to be held in St. Louis, additional legislation was passed authorizing a gold dollar to mark the occasion. 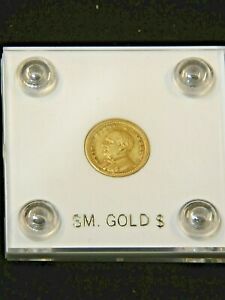 The coinage bill as passed on June 28, 1902, provided for a mintage of 250,000 gold dollars. The exact design was left open-ended, and the Mint transformed Congress' authorization into two coins with a shared reverse. 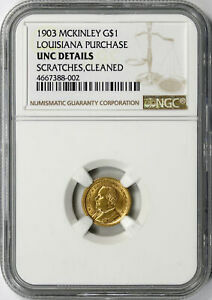 The obvious first choice for an obverse design was a likeness of Thomas Jefferson, president in 1803. A less obvious second choice occurred after William McKinley was assassinated by an anarchist at another world's fair in Buffalo in September of 1901. 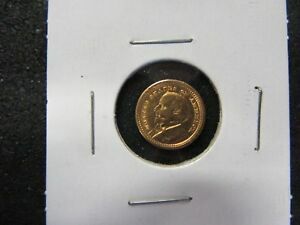 Logic should have dictated that Theodore Roosevelt be placed on the second coin, as he was president at the time of the centennial. 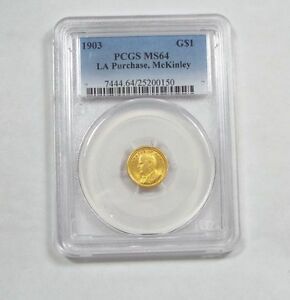 However, it was McKinley who signed the original appropriations bill for the exposition just six months prior to his death, so it was McKinley who was immortalized by having his likeness on the second of the two gold coins. 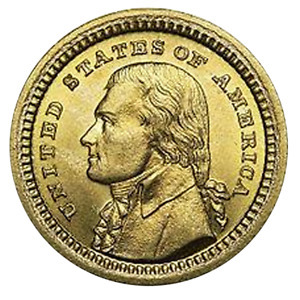 The image of Jefferson used on the coin was twice removed from life. Mint engraver Charles Barber modeled his portrait after one on John Reich's 1801 Indian Peace medal. Reich in turn had used the bust of Jefferson that was sculpted by Jean Antoine Houdon. 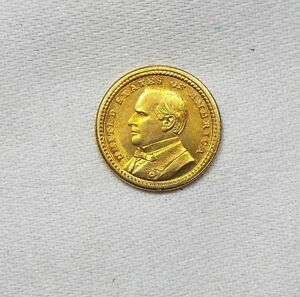 Barber showed an equal lack of initiative when it came to reproducing a likeness of the late president McKinley. He merely copied his own presidential medal - a composition called "deadly!" by no less a figure than the famed sculptor Augustus Saint-Gaudens. 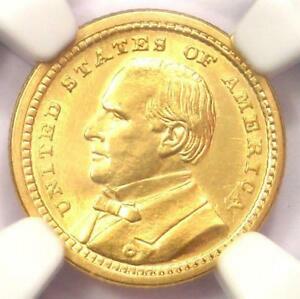 On both coins, the portrait is encircled at the periphery by the inscription UNITED STATES OF AMERICA. The reverse of the coins featured a safe and uninspired layout, with ONE DOLLAR 1803-1903 in the center, surrounded by LOUISIANA PURCHASE EXPOSITION ST. LOUIS at the edge. The only decorative device on the reverse is a single olive branch that separates the denomination from the centennial years. Presumably it symbolizes the peaceful means by which the 828,000 square mile territory was acquired. 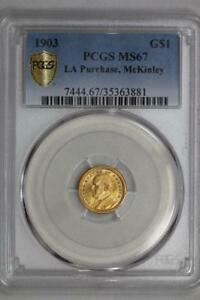 The 250,000 coins authorized by Congress (plus 258 pieces for assay) were struck at the Philadelphia Mint. The first 75,080 pieces were produced in December, 1902, followed by the remaining 175,178 in January, 1903. Although the coins were ready, construction delays kept the exposition itself from opening until April 30 of the following year, and it remained in operation until December 1, 1904. On the fairgrounds, the dollars, priced at $3 each, were distributed by coin dealer and energetic promoter of all things numismatic Farran Zerbe. Zerbe avidly sought to popularize coin collecting through his traveling exhibit, Money of the World. The exhibit toured the country for decades and was a part of several world's fairs, including the one in St. Louis. Zerbe was so well known and highly thought of by Mint officials that he was placed in charge of distribution and sales for the entire mintage of the Louisiana gold coins. In fact, it was his idea to increase sales by using two different portraits on the coins. Zerbe's enthusiasm for the project never waned, even when sales fell abysmally short. 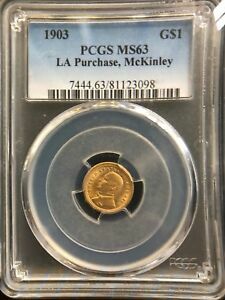 And sales certainly were a disappointment: The coins were available for less than the issue price for a decade following the celebration. 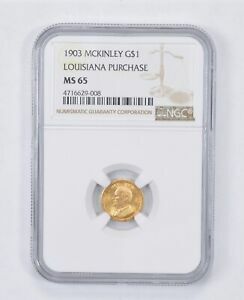 Although Zerbe retained thousands of specimens and continued to promote the coins for many years after the exposition closed, in 1914, the 215,000 pieces remaining unsold were finally melted. 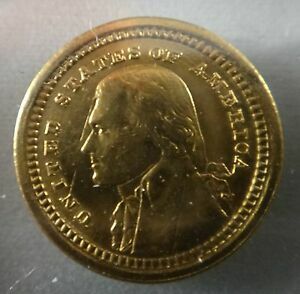 However, Zerbe had sold thousands of pieces at a discount to B. Max Mehl, the celebrated Fort Worth coin huckster, and Mehl offered the coins for many years thereafter. 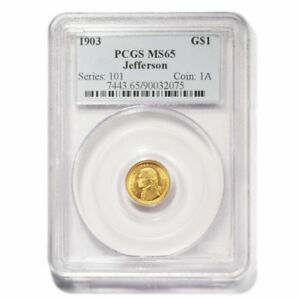 Unfortunately, as a commercial endeavor the coins were a flop, but in the intervening decades, collectors have embraced and actively pursued these first commemorative gold dollars. 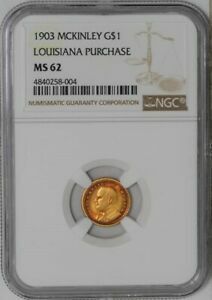 Although the vast majority of the coins were sold to members of the numismatic community, a substantial number were actually sold on the fairgrounds. Many of these pieces sold to the non-collecting public were used for jewelry and worked into broaches, stickpins, and cuff links. Such pieces will show irregularities on the edge or traces of solder on the reverse. However, since the bulk of the coins went into collectors' hands, most surviving examples are in the MS 60-64 range, with higher graded specimens somewhat scarcer, but still available. 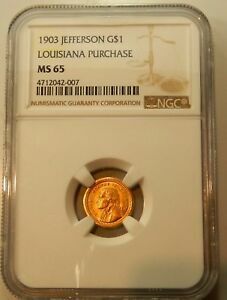 Generally, luster on the coins ranges from dull satiny to semi-prooflike, but occasionally, prooflike coins are encountered. Such pieces are suggestive of the even rarer proof strikings of each issue: The first 100 coins struck of each design were brilliant proofs. 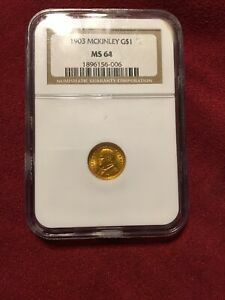 Each was inserted into a large cardboard mounting and secured with a long string and red-wax Philadelphia Mint seal attesting to the coin's special status. Only a few of these signed originals are known today. Although official records do not indicate how many of each design were melted, it has been generally accepted that about 17,375 examples survive of each issue. 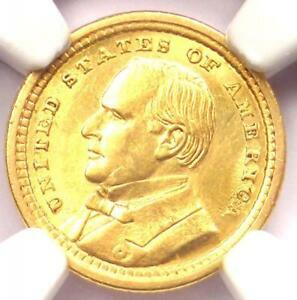 Today, with the advent of census data from third-party grading services, it appears that the coins with McKinley's portrait are slightly scarcer than the Jefferson pieces. 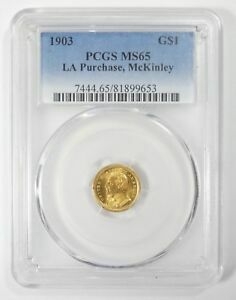 Generally thought of as two separate issues, most collectors of the commemorative gold series require one example of each for a complete gold type set. 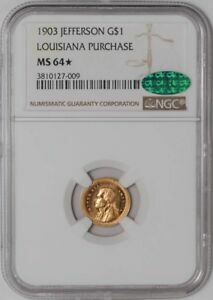 Pleasing mint state coins are usually available for a price, and occasionally pieces are seen with deep olive-green or golden-rose patina over the surfaces. Signs of friction are first evident on the obverse on the highpoint of the cheek. On the reverse, wear is first apparent on the olive branch and to the right of the 3 in 1803. Counterfeits are known of each issue: Coins that are not of Mint origin will have a "soft" overall appearance, showing depressions and tooling marks in the fields.